The State of Texas has developed a common course numbering system for all college courses. These numbers are used in identifying courses that transfer freely among public community colleges and universities. Courses are designated by an abbreviated name and number along with a descriptive title. The name used designates the instructional area in which the course is offered. The course number is a four-digit number in which the first digit designates the academic level of the course. A first digit of 1 designates an introductory-level credit course, and a first digit of 2 designates an intermediate or advanced-level credit course. A first digit of 0 designates a developmental (compensatory) course which cannot be applied toward either the required or elective hours for an associate degree or certificate. 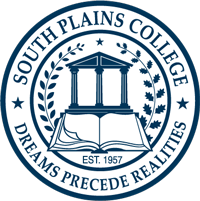 All courses taught at South Plains College are listed in this section. In the course description, certain information is placed in parenthesis following the course title. The first figure in the parentheses indicates the semester hours of credit for the course; the second figure indicated the number of lecture hours per week attended by a student enrolled in the course; and the third figure indicates the number of hours per week during which the student is in laboratory, practice session or other instructional activity related to the course. For example, (4:3:3) following the listing for Biology 1411 General Botany means that the course carries 4 semester hours of credit, that 3 hours per week are spent in lecture, and 3 hours per week are spent in laboratory. Some courses will also have a designation indicating the semester in which the course is offered. “F” indicates Fall, “S” indicates Spring, “S1” indicates First Summer Session, “S2” indicates Second Summer Session, and “Su” indicates either Summer Session.